This grilled potatoes recipe is a great alternative to a boring baked potato. In this recipe, we give the standard starch a flavor boost. We redo this dinner staple by simply adding onions, garlic, salt, pepper and butter. 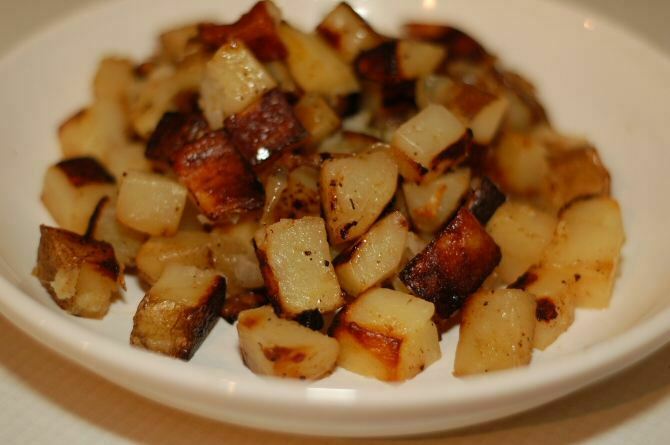 The result is a crispy, delicious potato side dish that is hard to beat. 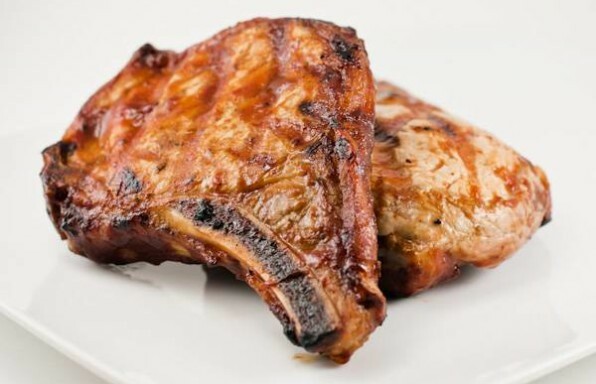 This goes great with new york strip steak, turkey burgers, grilled pork chops or grilled chicken breasts. Or you can look up other grill recipes. The idea is to create a sealed foil pouch the potatoes can cook in, where the flavors of the garlic and onions can co-mingle. 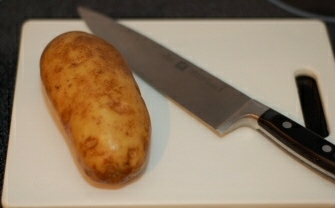 And by cutting them into cubes, the potatoes have more crispy edges and more surface for flavor. 1Dice one clove of garlic, or use a garlic press to press one clove. 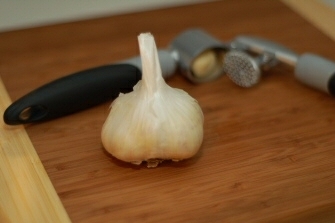 Set the garlic aside on the cutting board or in a small holding dish. 1Prep the foil. 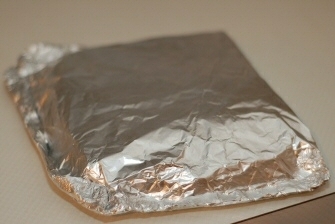 Tear off a large sheet of heavy duty foil, or double sheet of regular foil. The sheet should be large enough such that all of the potatoes can fit on ½ of the sheet, about 2 feet for 1 large baking potato, 3 feet for 2 potatoes. 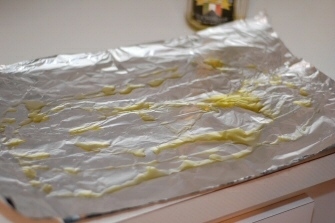 Drizzle the 2 tablespoons of olive oil over the foil. Spread the oil with a basting brush or clean fingers. 1Assemble the potatoes. 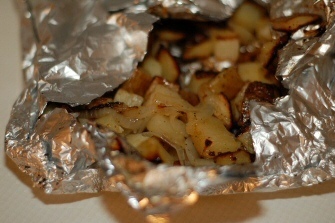 Add the potato cubes to the one half of the oiled foil. 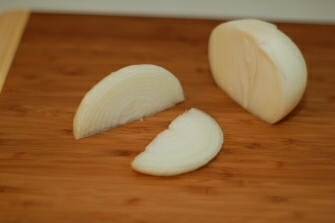 Add the sliced onion, spreading them around. Sprinkle the garlic over the potatoes, making sure to distribute the garlic as much as possible. Grind about 1 teaspoon of fresh pepper and add about 1 teaspoon of salt. Slice 1 tablespoon of butter into 3 or 4 chunks and spread them out over the mixture. 1Fold it up. Fold the foil in half, up to cover the potatoes. Crimp all sides of the foil to create a tight seal. 1Cook ‘em. 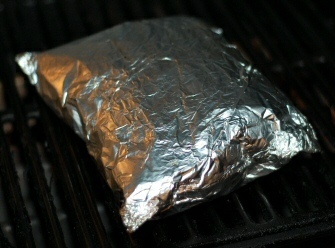 Now place the foil packet on a preheated grill over a direct medium low heat. Close the lid and let them cook for 5 minutes. Flip the foil packet over. We find it is best to use tongs and a spatula. Be careful not to poke a hole in the foil. Cook for 5 minutes and turn it again. Cook 5 more minutes then flip for a final 5 minutes. Remove from the heat. 1Cut open the foil and scoop out the potatoes. Optionally, you can add butter to taste, though you don’t need it. These crispy grilled potatoes serve as a great side dish. You can optionally add some fresh rosemary, or other favorite spices to boost the flavor even more. Grilling potatoes is a great way to bring new life to the boring same old same old. Try using one or two tablespoons of Dijon mustard for yet another twist. Greatest thing ever. Lots of flavor and super easy. Just what I was looking for.